A week ago, Renee Zellweger wrote a “scathing” essay at HuffPo in which she attempted to deny that she had undergone any (voluntary?) plastic surgery. She went on and on about how we were all monsters for daring to notice that she looked different a few years back. While she had some valid points about how women are judged on superficial things, and how the internet can be cruel to women in particular, it also seemed like Zellweger was not really telling the truth about what she had gotten done. Which is fine in the sense that she doesn’t owe us an explanation for her private and personal plastic surgery decisions. But on the other hand, don’t blatantly lie to the public at large and try to “shame” society for noticing that you look different. But [Zellweger’s essay] annoyed me because I’m sick of being told that if you walk into a room — or in this case, onto the red carpet in 2014 — looking like a totally different person from the last time I saw you, I’m morally bereft for wondering what the hell happened to your face. It’s not OK to be nasty or cruel, but most people are just trying to make sense of what they’re looking at. And you don’t get to tell them they don’t have that right. What’s with this weird argument people keep making that it’s somehow anti-woman or anti-feminist, when faced with a dramatically changed appearance that looks very much like it’s due to cosmetic surgery, to do anything other than pretend you don’t notice anything? Isn’t the opposite — pretending people’s appearances just magically change for no reason — actually the anti-woman thing to do? To act like rich people’s wrinkles just disappear? Like their lips get plumper and their thighs thinner by magic? Yep. Anyway, that leads me to this next story. Weeks ago, a critic for Variety got in trouble for daring to suggest that Renee doesn’t look much like Bridget Jones these days, and it was disconcerting to see this new-face on screen. To be fair, the critic went WAY overboard and took it to a ridiculous level. But it seems like that critic was merely a harbinger of reviews to come. 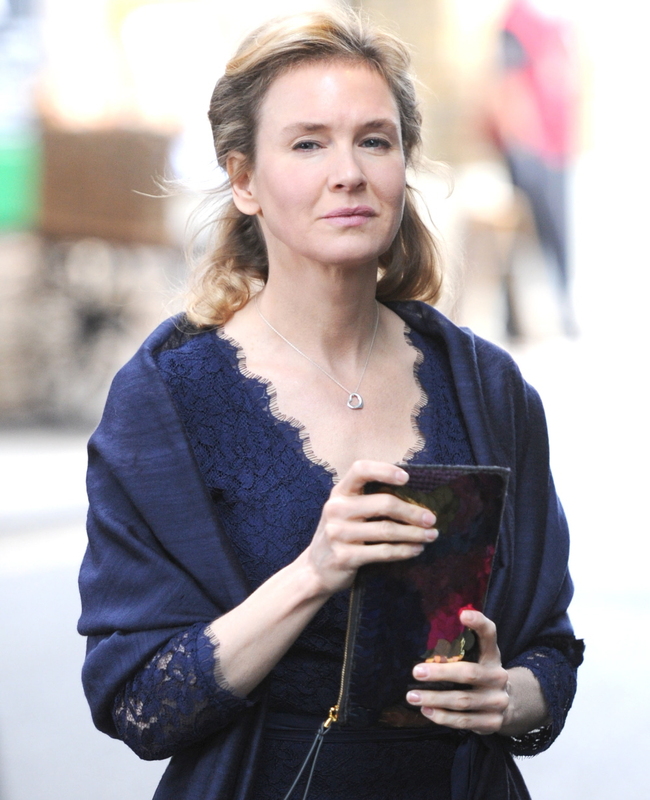 While I think critics are going to be careful about how they write about Renee’s face in the reviews for Bridget Jones’s Baby, I also think that there are going to be lots and lots of references about how Renee doesn’t really look like herself. Final thing: Hugh Grant was on Watch What Happens Live last night and when they put up images of all his female costars, he didn’t recognize Renee (because they used a recent photo). Ouch.